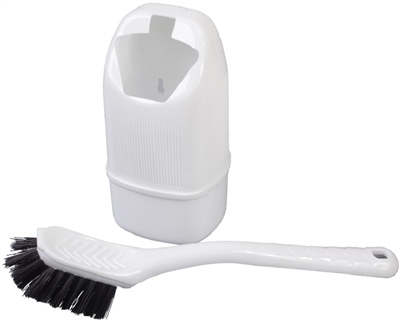 A wonderful little invention that is very reasonably priced and is delivered before a pull of the chain !Like the cassette loo in my campervan this little brush has its own compact cassette too! What a handy tool to have in the private room ! Buy one you too can have a clean loo!!! This is perfect! Slots away neatly, designed for spillage avoidance and a great price to boot. Highly recommended! This item arrived very fast from Camping World and will do the job fine. It's small and light and the bottom detaches so that it can be emptied of any liquid. All in all I'm happy. Cheap and cheerful, this is exactly what I was looking for. Rather than screw into the van wall I used self adhesive Velcro and it has worked out fine.